Finding Our Way Again by Brian McLaren is one of those rare books that you discover you need on your bookshelf for those times in your life when you are feeling spiritually dehydrated. It's easily the sort of book that you could read again and again at various stages in your life, and for lots of different reasons. 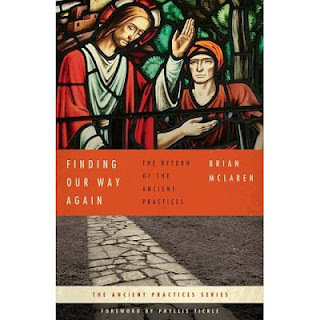 Finding Our Way Again was written in 2008, and is a departure of sorts from McLaren's usual fare, which has tended toward the political and theologically controversial. The book lays out a case for the need of spiritual practices for people of faith in today's culture, and then provides both the rationale and guidelines for how to do it. Finding Our Way Again also guides the reader through the ancient spiritual practices of the Church, demonstrating how they can both form and inform a vibrant and Spirit-filled 21st century faith. Even if you disagree with McLaren's theological assumptions, or you simply disagree with McLaren based on reading his other works, this is the sort of book that transcends those kinds of disagreements. I commend it to anyone who is searching for a thoughtful guide on how to develop a more excellent way of living the spiritual life.